Product prices and availability are accurate as of 2019-04-13 15:03:00 EDT and are subject to change. Any price and availability information displayed on http://www.amazon.com/ at the time of purchase will apply to the purchase of this product. 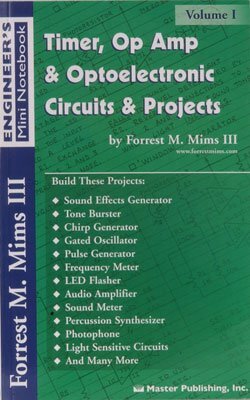 Volume I of the forest mims engineer's mini notebook Series includes three of his best-selling notebooks: 555 timer IC circuits; op amp projects; and electronics. This engineer's mini notebook features more than two Dozen 555 timer circuits that you can build, including three Tone generators, LED flashers, sound-effects circuits, and a touch switch. It also includes more than 50 operational amplifier (op amp) circuits, many with simple formulas to help you modify them for special circuits of your own design. A wide range of optoelectronic circuits and projects are featured, including many LED circuits and various lightwave communication systems.